In Warren Buffett’s own backyard: Underfunded Omaha libraries. National digital library endowment, anyone? "Currently, Omaha Public Libraries' spending per capita is substantially below that of surrounding communities." – Library Board of Trustees President Mike Meyer, as quoted by KETV, source of a related video. Wait. It gets worse. Library branches may cut hours, one may even close, and meanwhile the budget for books and other content is suffering. Hello, Warren Buffet? Aren't you the same Omaha guy who has sent many billions out of town for Bill Gates's foundation to hand out—with most of it leaving the U.S.? Global altruism is praiseworthy, given all the need for economic development and better health in developing countries; but how about Omaha itself? "The library already sees six-month wait times for materials" such as books that patrons request, says KETV. What's more, "interim director Norma Pontee said there are serious maintenance needs across the city. Some furniture and carpet" have not "been cleaned in 18 months." And thinking more strategically, how about a national digital library endowment to help address the library needs of U.S. cities, especially those without billionaires in their midst? Your current worth, Mr. Buffett, is about $72 billion. I'm sure your family has given before to local libraries, but how about reassessing the current levels of philanthropy for Omaha? Meanwhile consider that the new Omaha digital library, along with the all-digital Bibliotech system down in the San Antonio area, could be a testbed for many systems elsewhere. It isn't as if we should replace all paper books with e-books overnight, but Omaha could help pave the way for greater efficiencies at libraries elsewhere. Now that Jim Billington is on his way out as librarian of Congress, perhaps his successor at LOC build on the work of the Digital Public Library of America. LOC could help work toward the creation of separate public and academic digital systems to help get the most books and other items out to the most patrons at the least cost. Along the way, extra digital resources would be a godsend for K-12 and the economy, including start-ups. Perhaps LOC could even host one or both of the systems that the endowment helped fund. Content is especially important. In all too many cities, the book budget is the first to suffer due to competing needs both within and outside library systems. While Omaha's mayor actually has proposed a higher library budget, this still won't be enough due to inflation and other causes. Yes, immediate local needs first, Mr. Buffett. Care to help all branches in the Omaha system keep full hours and enjoy better than a substandard budgets for books and other items? Either the old-fashioned way or electronically, you should buy or borrow or otherwise obtain a copy of Bleak House (also available through Project Gutenberg). Then read up on the character of Mrs. Jellyby, who, while horridly neglecting her own family, constantly fixates on the fate of Africans. Don't you pride yourself on your own hometown? I'll not dismiss you here as another Jellyby. Let's see what you and others in your family can do. Looking beyond Omaha, we should help people in both the U.S. and developing countries in a meaningful way. If you doubt we're in trouble, just read Our Kids: The American Dream in Crisis. Among other things, it mentions the benefits of libraries and also reminds us of the digital divide—especially in regard to how well-off kids use the Net vs. the disadvantaged ones. A national digital library endowment, expanding resources ranging from e-books to training in information literacy, would be one way to help avoid the Jellyby Syndrome. The current national average on library content spending, by the way, is a pathetic $4 per capita or less than the price of a Big Mac here in the U.S, a figure well known to you via Berkshire-Hathaway's partial ownership of MacDonald's. Your company is in my retirement account. Long term, I trust you and your colleagues to invest wisely on behalf of shareholders. As a philanthropist, you should do the same for Omaha children and parents and the rest of America. A national digital library endowment could help turn things around and dovetail nicely with the Gates-Buffett Giving Pledge. None other than the late William F. Buckley Jr., our political opposite, wrote two "On the Right" columns on behalf of a national digital library and philanthropy to help fund it, in line with the basic TeleRead vision from the 1990s. Ideally Buffett and encourage policymakers and other philanthropists to catch up with WFB. On top of everything else, Buffett should keep in mind that as a patron at least, he and public libraries go way back. "I started investing when I was 11," the Motley Fool site quotes him, "but I started reading about it when I was seven. So I'd gone through all—I'd read every book in the Omaha public library by the time I was 12 on investing and the stock market. I had a lot of fun, but I never really found out, I never really got grounded in anything. It was entertaining, but it wasn't going to be profitable." 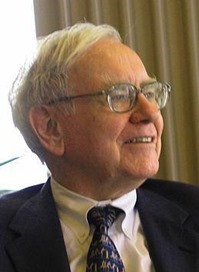 If nothing else, however, the Omaha Public Libraries fueled Buffett's fondness for investments. Besides, imagine how national digital library systems could help young investors not only with books but also with librarian-assisted access to authoritative databases. Such an approah could make informed investing more doable for the nonelite and maybe even for a future Buffett. Simply put, in helping libraries both locally and nationally, Warren Buffett would be giving back to the people who helped him amass that $72 billion. Related: L.A. kids can't even read a Warren Buffett bio at their school library—because it's shut down: How Buffett and other billionaires could help, from LibraryCity, my library advocacy site. Also see Why We Need a National Digital Library Endowment (Education Week), Endow a National Digital Library (Library Journal) and The Rich Could Tackle Many Social Ills by Supporting a National Digital Library Endowment (Chronicle of Philanthropy).